Before I succumbed to the stomache bug going around my family Friday night, I watched most of episode one of Ken Burns' Prohibition. I was quite fascinated. I had been meaning to watch it for a while. One of the things I learned that I didn't know before was that the proponents of prohibition, known as the "drys" had backed the creation of an income tax because one of the key political strengths of the "wets" (mainly represented by German brewers) was that around 1/3 of Federal revenues at the time came from excise tax on alcohol. Add this to the Scopes Trial and the 1920s seem like a particularly interesting decade. I'm pretty sure our house (a Bungalow) was built in the late 1920s. And Trinity Church was built at the end of a streetcar line in Springfield in 1928. Interesting to me that a Methodist Church would build a very Catholic-looking gothic cathedral in the 1920s. The one thing I regret is that we didn't take a picture. I remember the scene from the picnic table where we laced up our cleats, my brothers and I: across the green grass field in Fontana, California, were the San Bernandino Mountains, looming. It was an amazing backdrop and would have made a great picture. Chris and I talked about how it had been years since either of had played soccer. I used to play in a pickup game in Northampton, but that was 13 or 14 years ago now. Matt said that a guy he knew from church introduced him to this soccer game, though it a few exits further up the freeway from him. It was really great to play. It had been a while. I used to play soccer regularly. Now I play tennis, mostly. But to get a chance to play soccer again, and moreover, with my two brothers, that was a treat. Enough people showed up for two games, and we ended up getting split up, so that Matt played in one game and Chris and I played in another. Chris and I played on the same team, both of us wearing white shirts. Our game started off rough, with the other team scoring a number of unanswered goals. But then the play seemed to level off. In a memorable moment, Chris and I were on the attack and he had the ball on the left wing. He sent in a crossing pass on the ground and I punched it in with a left foot. Connecting on a goal with my brother was a great feeling. I ended up scoring four goals. I have no idea what the score was at the end. Chris said afterwards I was the star of the team. He did a lot of running on both flanks. After about 10 or 15 minutes, I was really sucking wind, but I was able to keep going. I decided I couldn't run end-to-end, and drifted toward the front. I played in the middle, sort of an attacking mid, trying to range as much as I could while conserving energy. We had a good group, with a range of talent levels and backgrounds. Some Hispanic guys, some Middle Eastern guys, some Asian guys. Only a couple of women. They played on opposite teams, and both stayed up front, so seldom encountered each other. I lost the bottom of one of my cleats, and played most of the game without cleats on the ball of my right shoe. It didn't seem to matter much, although I think I soaked up some water through the bottom of the shoe. We ended up bailing after the break, although the game kept going. We reasoned that we had a good go and didn't want to push ourselves. 11:35 am - "Losing is what I do." I found this interesting blog post by Guardian writer Rick Gekoski a little while back, probably while casting about, looking for things for my sports journalism course. In it, he describes a couple of books he wished he'd written (he's got me already), and one of them was inpired by a quote from American tennis player Todd Martin after losing at Wimbledon. Gekoski frames it in terms of the journalist asking Martin a leading question about how hard it was to get so close and not to win, while Martin thinks about it differently (and, according to Gekoski, more interestingly). "Losing is what I do." It was a sentiment that located something true, and – unless you're as smart and emotionally mature as Todd Martin – cruel about professional sport. Because for every winner, there are myriads, thousands, tens of thousands, of losers, and in our fixation with who wins we blind ourselves to the stories – the spectacle, the drama – of those supremely talented athletes who do not. Gekoski goes on to say, "I am interested in losers. After all, by the highest standards, it's what most of us are. Lacking supreme talent, we do the best we can, and that is often pretty good." I agree, that would have made an interesting premise for a book. We've had highs in the mid to upper 90s all week this week, with high humidity as well. This is the kind of heat that we usually get for one or two days a summer. But this week, it seems like it will never end. We have been trying to walk in the morning, before the heat gets too bad. But some time before mid-day, we usually start to crack and have to find some way not to kill each other. We went to Brattleboro yesterday, to the Carter's outlet store and to the Brattleboro Art Museum. The museum had a really cool exhibit of art by Red Grooms, which was a little like cubist folk art. He had a full-size sculpture of a city bus that you could walk in and stand next to the vibrant riders. We've also been to the pool nearly every day. It's been nice to take a dip in the Green River. The water is always refreshingly cool. And the kids love playing in the sand on the beach. This morning, I walked a familiar route from my house, toward Beacon Field. As I turned from Madison Circle onto Stevens Street, I saw cars parked on the other side of Sanderson Street, by the tennis courts. And then I saw people playing, on the other side of the hedge. It was such a lift! I broke into a big smile. There were two courts of people playing doubles -- nearly all people I knew -- and one guy brushing the lines on another court. That guy was my playing partner for the morning. It is one of the simple joys of my life now that these clay courts are only two blocks from my house, and I can walk, with my racquet backpack on my back, over to play tennis. 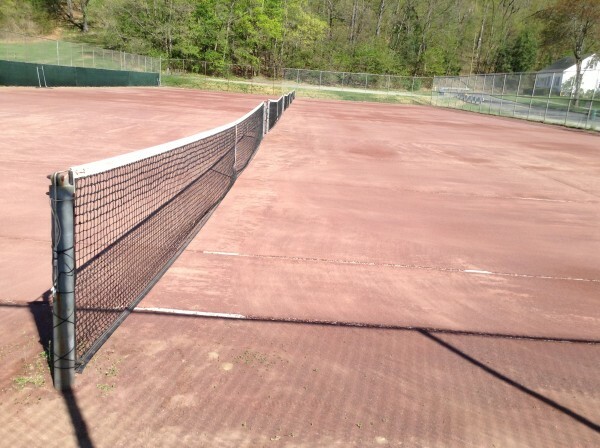 It was these courts that brought me back in the game. In fact, it was watching some of these same guys playing on these courts -- old guys, having fun -- that made me dig my raquet out of the closet. I love clay courts. It's not necessarily for tennis reasons, although there are those, too. But playing on clay is just satisfying. It's old school, organic, natural. I love the discipline of brushing the courts when you're done. I love how a well-groomed clay court looks, like one of those zen gardens. I love that you show up to nail the lines down. I love that they take the nets and the lines down for the winter and they go back up in Spring. Which brings me to today. For weeks, I have been driving by the courts, watching them get ready. First raked and rolled, then the lines put down. Last weekend, a bunch of us showed up with hammers and buckets and nailed in all the lines. They are rolls of tape that are nailed onto the clay court. The DPW guys who put the lines down put a few nails in, but we volunteers do the rest. Then, this week, the top dressing and the calcium chloride, and finally, the nets. Today, the locks were off the gates and the courts were open for play -- a month earlier this year than last year. And here we were, out playing on them. Court one was a little bare -- some of the top dressing had blown off -- but it played well. Today, the yellow balls got tossed up into the air and spun over the nets. Today, you could hear the thwack of racquets hitting those balls, back and forth. And that familiar coterie of players out there, just enjoying the beautiful morning by playing tennis. A great May day. We paddle the River Rat to remind ourselves that we're alive. This year, 329 boats entered the 50th annual River Rat Race. We all received a number and sat in a cold, swift river and felt that jolt at the blast of the cannon, surging forward. It's on. And we careen down the river, bumping. Do you bump?, people will ask. Yes. This is the River Rat. We don't race in heats, we don't stagger start. It is the Hobbesian competition. You spend the first mile, two miles of the race constantly bumping and maneuvering in close quarters with other boats. There are times where there is no water to put your paddle in. But there is a certain rush to that contact, when your blood quickens and you pull extra hard on your paddle, knowing you are in direct competition with another boat. They could turn you, spin you, knock you off course, push you into another boat, or just overtake you. And you don't want it to happen. The water churns, you grunt against your paddle, trying to muscle your bow around, or propel you away from the other boat. There is a primal, rite-of-spring aspect to the race. You do it to finish. You cross under that banner in Orange and feel relief. You paddled for six miles and you made it. You feel alive. That's what we did today, Miguel and I. We started at number 315 and we finished somewhere in the middle. We'll find out exactly where in the next few days. But we felt good. Afterwards, we went to the Voo and ate hamburgers and drank beer. Mwa ha ha. In the Fantasy Baseball draft the weekend before last, I took Toronto starting pitcher R.A. Dickey with my fifth pick. I'd had Dickey on my team last year, picking him up as a free agent mostly because of the novelty that he was a knuckleballer. It turned out to be a genius move, as he won 20 games for the Mets and was the NL Cy Young Award winner. It turns out that he was also an English major at the University of Tennessee. I recently finished listening to an audiobook version of his autobiography, Wherever I Wind Up. He has quite an interesting story. Most knuckleballers take up the pitch as a mid-career move, because their career isn't moving in the right direction and they need a change. Dickey is no different. He was drafted with some fanfare by the Texas Rangers after pitching for the 1996 Olympic team. But then it was discovered that he had no ulnar collateral ligament in his pitching arm. The Rangers backed away from their original offer. Dickey ended up bouncing around in the minor leagues, eventually being categorized as a AAAA player: too good for AAA ball, but not good enough for the big leagues. Then he switched to the knuckleball and joined the oddball fraternity. He's 38 now and just coming off of his best year as a pitcher. He's at an age where he should be retired already, but knuckleballers can pitch into their 40s, because the pitch doesn't strain the arm much. In his book, Dickey relates that he was sexually abused as a boy. He relates his parents' short-lived marriage and his hardships growing up. He relates his conversion to Christianity. He was an award-winning poet at his high school in Nashville. But what I liked best was his description of the knuckleball as a pitch and the tight-knit fraternity of knuckleballers. In learning to pitch the knuckleball, a relatively slow pitch whose deceptive power rests in the fact that it doesn't spin much or at all, causing it to behave unpredictably on its path to the plate, confounding batters and catchers alike. It seemed to me that Dickey's evolution as a pitcher was not only in converting to the knuckleball, but also learning to let go of anxiety and worry and to live in the moment. I listened to his book after re-listening to the Timothy Galway classic, The Inner Game of Tennis, and Dickey seems to be well aware of the inner game in his exploration of pitching. The arena speakers blared the opening strains of AC/DC's "Hell's Bells" and the message on the jumbotron read, "Scream!" And gosh darn it, the 2,600 or so people in the stands stood up and summoned up a respectable noise. After taking somewhat dismissive notes throughout the game, now I was getting caught up in the experience. The Springfield Armor, the city's sub-.500 D-League basketball team, was tied 108-108 with the Canton Charge. Here are some facts that I learned at the game Wednesday night that help explain D-League basketball. The oldest player on the Armor has been a pro for only six years. The game's leading scorer, a slashing guard named Dominique Jones (pictured), had only been with the team for nine days. Only one of the five starters was a member of last year's team. And just hours before game time, two of the team's stars were called up to join the NBA's Brooklyn Nets, on the Nets' western road trip. I had scored press credentials to the game for my Sports Journalism students at WNEU. Two of them were able to make the game and I accompanied them. We got to sit at a press table down by the court, and I was permitted to sit on the parquet floor with my camera and shoot some pictures of the game. And it turned out to be a doozy. The score was deadlocked at 108-108 for most of the last two minutes, until the Armor's big man, Willie Reed, connected on an 8-foot catch and shoot jumper off an inbound pass, with less than a second left on the clock. It was the team's last home game of the season, and with five road games left to play, it meant that they had not been officially eliminated from playoff contention yet. The best part was being able to be there in the media huddle for the coach's post-game interview, and to talk to the Republican's Jeff Thomas, who was there to cover the game for the hometown paper. The students got a chance to see what being a sports reporter felt like, up close. Although today I look out the window and see six inches of snow covering the ground, only three days ago, my Dad and I were playing tennis outdoors. We played on the hard courts at Forest Park in Springfield. It was about 40 degrees and sunny, with a little wind, but the courts at Forest Park are surrounded by trees, so we were somewhat protected from the wind. It was fun. I had been trying to play tennis once a month during the winter. I missed February, but had played indoors in both December and January. Playing tennis outdoors seemed very optimistic and forward-looking. We just hit, playing for some points with me serving, but didn't keep score. We played for more than an hour, maybe an hour and a half. I started in warm-up pants and a light jacket, but stripped down to a long-sleeve shirt after we played for a while. Today's poem is from the Poem-A-Day e-mail from the Academy of American Poets. In "Tis Late," April Bernard spins a conceit out of a "local street character" who sells flowers and recites poems. I saw the poem earlier today, read a few lines and then skipped on. But now I returned to it, at the end of my teaching day, weary and feeling overwhelmed with my responsibilities, not always up to the task. Isn't it funny how sometimes it's the right time for a poem? Even me, a contingent instructor, standing in front of a classroom -- overeducated, underachieving -- I clicked on to the John Donne poem that Bernard quotes in her poem, "At the round earth's imagined corners (Holy Sonnet 7)," and I thought about the small pleasure in life of stumbling upon a poem, a poem from another time, a poem that reminds me of quiet corners of serious buildings with art in them. Holy sonnet, holy youth of imagining infinities, holy small pleasures before holy drive home on wet roads still cutting through weary snow banks. Gray skies, all that. Someone's more authentic grief. More than hers or mine, except our ability to imagine.